Rockcliff Metals Corporation (“Rockcliff”) (TSX-V: RCLF) (FRANKFURT: RO0, WKN: A2H60G) is pleased to announce that, further to its press release of February 22, 2019 (the "Transaction Press Release") announcing the reorganization transaction (the "Transaction") involving a financing (the "Greenstone Subscription") led by Greenstone Resources II LP ("Greenstone") and a transfer of significant assets from Norvista Capital Corporation (TSX-V: NVV) ("Norvista") and the press release of March 6, 2019, it has closed the Greenstone Subscription. Rockcliff also wishes to announce that the Management Information Circular dated March 18, 2019 (the "Circular") with respect to the Annual and Special Meeting of Shareholders to be held on April 22, 2019 (the "Meeting"), and all related materials, have been filed on the SEDAR profile for Rockcliff at www.sedar.com. On March 29, 2019, Rockcliff closed the Greenstone Subscription and issued 49,819,167 Subscription Receipts to Greenstone in accordance with the provisions of the Subscription Agreement signed with Greenstone (the "Closing"). Greenstone had wire-transferred the sum of US$15,000,000 (the "Escrow Proceeds") to Gardiner Roberts LLP in trust on March 13, 2019 to be held in escrow by Gardiner Roberts LLP as Escrow Agent in accordance with the terms of the Subscription Agreement and an Escrow Agreement signed in respect of the Escrow Proceeds. As a result of the Closing, the Escrow Proceeds are now being held for Greenstone as to US$9,363,498 for the Greenstone Commitment (as referred to in the Transaction Press Release) and held as to US$5,636,502 in escrow pursuant to the terms of the Subscription Receipts to be released upon receipt of Rockcliff Shareholder approval to the Transaction being sought at the Meeting, the closing of the Asset Acquisition (as described in the Circular) and regulatory approval to listing the Rockcliff Shares issued pursuant to the Transaction on the Canadian Securities Exchange (the "Conditions"). Securities issued pursuant to the Greenstone Subscription are subject to a statutory four month and one day hold period from the Closing. The common shares of Rockcliff to be acquired by Greenstone upon conversion of the Subscription Receipts to common shares following the satisfaction of the Conditions will be subject to escrow pursuant to the provisions of National Policy 46-201 as further described in the Circular. Rockcliff Metals Corporation (“Rockcliff”) (TSX-V: RCLF) (FRANKFURT: RO0, WKN: A2H60G) is pleased to announce that it has a called an Annual and Special Meeting of the Shareholders of Rockcliff for Monday, April 22, 2019 (the "Meeting") to seek approval to the reorganization transaction (the "Transaction") involving a financing (the "Greenstone Subscription") led by Greenstone Resources II LP ("Greenstone") and a transfer of significant assets from Norvista Capital Corporation (TSX-V: NVV) ("Norvista") as disclosed in the press release dated February 22, 2019 (the "Transaction Press Release"). Rockcliff also wishes to advise that the parties to the Transaction have agreed to extend the closing date of the Greenstone Subscription until no later than April 2, 2019. As a result, Rockcliff will be extending the previously announced Existing Shareholder Offering until no later than Friday, March 29, 2019. Shareholders interested in participating in the Existing Shareholder Offering should contact, or have their registered broker contact, Bill Johnstone, Corporate Secretary of Rockcliff, at bjohnstone@grllp.com or (416) 865-6605 to obtain a copy of the subscription agreement for Subscription Receipts. Requests should be received by no later than March 25, 2019 so that subscription agreements can be signed and funds can be received by Rockcliff by no later than March 27, 2019. Rockcliff Metals Corporation (“Rockcliff” or the “Company”) (TSX.V: RCLF) (FRANKFURT: RO0, WKN: A2H60G) is pleased to announce the signing of the formal Purchase Agreement with RNC Minerals (TSX: RNX) ("RNC") to acquire fourteen properties (the "Acquisitions") located in Snow Lake, Manitoba. The Acquisitions from RNC's wholly-owned subsidiary, VMS Ventures Inc., call for the issuance of 2,250,000 common shares of Rockcliff to RNC. Red Cloud Klondike Strike Inc. acted as financial advisor to Rockcliff. Please view Figure 1 below for the location of Rockcliff's property portfolio. Click image to view larger or click here. Rockcliff Metals Corporation (“Rockcliff” or the “Company”) (TSX.V: RCLF) (FRANKFURT: RO0, WKN: A2H60G) is pleased to announce that a fully permitted, 2,500 metres, 15-hole drill program will commence this month on the Company's Bur Zinc Property located in Manitoba, Canada. The objective of the program is expansion of the known high grade Volcanogenic Massive Sulphide (VMS) Bur zinc deposit limits. Rockcliff is the largest junior landholder in the Flin Flon-Snow Lake greenstone belt which is the largest Paleoproterozoic VMS district (copper, gold, zinc, silver) in the world that also contains gold mines and deposits. Rockcliff's President and CEO Ken Lapierre commented: "The Bur zinc deposit is one of the highest-grade undeveloped zinc-copper rich VMS deposits within trucking distance to an operating base metal mill facility. The drilling program will test above and to the south of the known mineralization of the deposit." A report was prepared on the Bur Zinc Property in 2007. Rockcliff is treating the estimate of mineral resources in the Bur Deposit Report as a "historical estimate" under NI 43-101 and not as a current mineral resource. Notes: 1.CIM definitions were followed for the estimation of mineral resources. 2.Mineral resources are estimated at a zinc equivalent cut-off of 5%. 3.Cut-off grade was based on a zinc price of US$1.15 per pound and a copper price of US$2.35 per pound. 4.Given the tonnage, grade and orientation of the deposit, AMEC considered the Bur Deposit to be reasonably amenable to extraction using underground mining methods. 5.Specific Gravity measurements used to estimate the mineral resource tonnes ranged from 2.64 to 3.74 with an average of 3.16. 6.A minimum mining width of 3 metres was used. 7.Mineral resources are not mineral reserves and do not have demonstrated economic viability. 8. The deposit was documented in a report dated October 1, 2007 and titled "Bur Project, Snow Lake Manitoba, Canada NI 43-101 Technical Report" (the "NI 43-101 Bur Deposit Report"). The report was prepared for Hudbay by AMEC Americas Limited (AMEC) and was filed on Hudbay's SEDAR profile on January 31, 2008. Rockcliff can earn a 100% interest in the Bur Zinc Property from Hudbay Minerals. Please refer to Rockcliff's news release dated September 26, 2016 for specific terms of the option agreement. Rockcliff is a Canadian resource exploration company focused on base metals, gold and royalties in the Snow Lake area of Manitoba, Canada. Rockcliff is the largest junior landholder in the Flin Flon-Snow Lake greenstone belt which is home to the largest Paleoproterozoic volcanic-hosted massive sulphide (VMS) district (copper, gold, zinc, silver) in the world and also contains gold mines and deposits. Its extensive portfolio of properties totals over 3,700 square kilometres. It includes eight of the highest-grade undeveloped VMS deposits and 5 lode-gold properties including the historic Rex-Laguna gold mine, Manitoba's first and highest-grade gold mine. Rockcliff Metals Corporation (“Rockcliff” or the “Company”) (TSX.V: RCLF) (FRANKFURT: RO0, WKN: A2H60G) is pleased to announce that it has entered into a Letter of Intent ("LOI)", to be followed by a formal Purchase Agreement, with RNC Minerals (RNX) ("RNC") to acquire fourteen properties (the "Acquisitions") located in Snow Lake, Manitoba. The Acquisitions from RNC's wholly-owned subsidiary, VMS Ventures Inc., is in consideration for the issuance of 2,225,000 common shares of Rockcliff to RNC. Red Cloud Klondike Strike Inc. acted as financial advisor to Rockcliff. Rockcliff's President & CEO Ken Lapierre stated: "the Company could not pass on the opportunity to purchase 100% interest in quality properties immediately adjacent to our existing property portfolio, including a historical high-grade VMS deposit. With no near-term expenditure requirements and $4.0M in banked assessment credits from previous exploration to draw on, Rockcliff has significantly upgraded its portfolio in the world-class VMS and gold-rich camp. We are presently completing an extensive due diligence on all 14 properties. Once completed, we look forward to finalizing the formal Purchase Agreement and adding these assets to Rockcliff's extensive property portfolio in and around Snow Lake, Manitoba." Rockcliff is the largest junior landholder in the Flin Flon-Snow Lake greenstone belt ("Belt") which is the largest Paleoproterozoic VMS district (copper, gold, zinc, silver) in the world and also contains gold mines and deposits. The Acquisitions are subject to a number of conditions standard for a transaction of this nature, including, but not limited to, satisfactory completion of due diligence by Rockcliff, approval by the TSX Venture Exchange and execution of a formal Purchase Agreement on or before January 31, 2019. Rockcliff Metals Corporation (“Rockcliff” or the “Company”) (TSX.V: RCLF) (FRANKFURT: RO0, WKN: A2H60G) announced today the identification of multiple Volcanogenic Massive Sulphide ("VMS") targets on the SLS #2 Property, and has acquired through map staking a 100% interest in two immediately adjacent land packages totalling 174,379 hectares. Rockcliff is the largest junior landholder in the Flin Flon-Snow Lake greenstone belt ("Belt") which is the largest Paleoproterozoic VMS district (copper, gold, zinc, silver) in the world and also contains gold mines and deposits. Rockcliff's President & CEO Ken Lapierre stated: "With the addition of these large exploration properties, Rockcliff is now well positioned in an underexplored part of a world-class VMS Belt buried below a thin limestone cover. Rockcliff now controls almost 3,000 square kilometres of continuous underexplored geology in the area with a significant VMS discovery potential. Rockcliff will explore and advance this area of the Belt and will focus on identifying priority 1 VMS targets for the purpose of drill testing. Additional information on our exploration efforts in this area will be forthcoming when our compilation efforts are complete." Please review the image on the following page which highlights the strategic location of all of Rockcliff's extensive property portfolio including the large district-sized newly acquired SLS #3 and SLS #4 properties and the immediately adjacent SLS #1 and SLS #2 properties. The SLS #3 and SLS #4 properties host 7 Mineral Exploration Licenses (MEL) totalling over 174,379 hectares and are located in an area termed the Snow Lake South Emerging Mining Camp. The SLS #3 and SLS #4 properties strategically cover an underexplored area hosting the southeast extension of the world-class and prolific greenstone belt which is home to over 30 VMS mines and 10 gold mines, the majority of which have been discovered north of the Phanerozoic limestone cover. The SLS #3 and SLS #4 properties are located south of this cover, where prospective greenstone occurs under a thin layer of limestone that progressively reaches up to 100 metres thick. Though this cover has impeded earlier exploration efforts, modern scientific advances in geophysical techniques have allowed a "window effect" through the limestone so potential VMS targets can be identified. At the SLS # 2 Property, an exhaustive data compilation effort was completed of all available public geophysical datasets including GSC Airborne Magnetics, GSC Gravity, and high resolution SPECTRUM airborne surveys. A litho-structural interpretation of the entire area was undertaken including a detailed analysis of several nearby VMS deposits. The aim of these studies was to provide a better understanding of the litho-structural environment under the limestone cover that could be associated with VMS mineralization and to make recommendations for areas which could be prospective for VMS discovery. Recent analysis of gravity, magnetics and electromagnetics led to the identification of eight separate high-priority target areas within the SLS #2 Property and was the basis for acquisition of the immediately adjacent SLS #3 and SLS #4 properties. Rockcliff now controls a 100% interest in the SLS #1 through to SLS #4 properties, a land package south of the cover, totalling almost 3,000 square kilometres with no underlying royalties. It has unfettered access to explore and discover metals within the property limits. Expenditure requirements for Mineral Exploration Licences are defined by the Province of Manitoba within the Mines and Minerals Act. These expenditures must be completed and submitted annually to the Manitoba Government to maintain the 4 SLS properties in good standing. The total first year expenditure commitment is $361,723. Rockcliff Metals Corporation (“Rockcliff” or the “Company”) (TSX.V: RCLF) (FRANKFURT: RO0, WKN: A2H60G) is pleased to announce that a first phase drill program has been completed on the Company's high-grade Laguna Gold Property located in Snow Lake, Manitoba. The Laguna Gold Property was last drilled in 1944 and hosts the past producing Rex-Laguna mine that was Manitoba's first and highest-grade gold mine. Rockcliff's President & CEO Ken Lapierre stated: "We look forward to the assay results from the first drill program completed on the property in over 70 years. The drill program not only identified depth extents of several historical gold bearing surface quartz veins − it also discovered new quartz veins with visible gold. Several holes were extended well beyond their original target depths as mineralized quartz veins and surrounding mineralized host rock were intersected at depths of over 500 metres. Exploration will continue in 2019." See Figure 1 on the following page highlighting Rockcliff's 5 district-sized Snow Lake gold properties including the Laguna Gold Property. The purpose of the drill program was to determine if known historical gold bearing quartz veins had depth potential and to discover additional auriferous mineralization. A total of six widely spaced holes totalling 2,552 metres were drilled across a strike length of 2,115 metres within the six-kilometre-long Laguna Gold Mine Trend. All holes intersected mineralized quartz veins and mineralized tuffaceous and porphyritic host rock. Several holes discovered new mineralized targets for future testing. Two of the six holes intersected very fine-grained flecks of visible gold within several mineralized quartz veins. Pending assay results in the coming weeks will be announced once all samples are verified. The Laguna Gold Property hosts the Rex-Laguna gold mine, Manitoba's first and highest-grade historic gold mine located within the Snow Lake Gold camp. The camp is located within the Flin Flon-Snow Lake greenstone belt, a belt known originally for its high-grade gold mines and now for its high-grade base metal mines. Historical, intermittent gold mining at Rex-Laguna, between 1916 and 1939 produced over 60,000 ounces of gold grading 18.7 g/t. The Laguna Gold Property includes 28 contiguous mining claims totalling 3,501 hectares, covering a minimum of 6.0 kilometres of prospective strike length of the Laguna Gold Mine Trend. The gold mineralization on the Laguna Gold Property is controlled by thrust faults attributed to the major regional Crowduck Bay Fault which crosses the entire length of the Laguna Gold Property. The known gold-rich quartz veins along the northwest limb of the Herb Lake Syncline typically occur where the faults intersect quartz-feldspar and biotite porphyry stocks that intrude Missi Group sedimentary and volcanic rocks. Quartz, iron carbonate-albite-sericite alteration commonly overprints peak regional metamorphic assemblages within gold-bearing vein margins. Mineralization in quartz veins and surrounding tuffaceous and porphyritic wall rock consists of pyrite, arsenopyrite, chalcopyrite, sphalerite, galena and pyrrhotite. Native gold is associated within and along the margins of quartz veins. 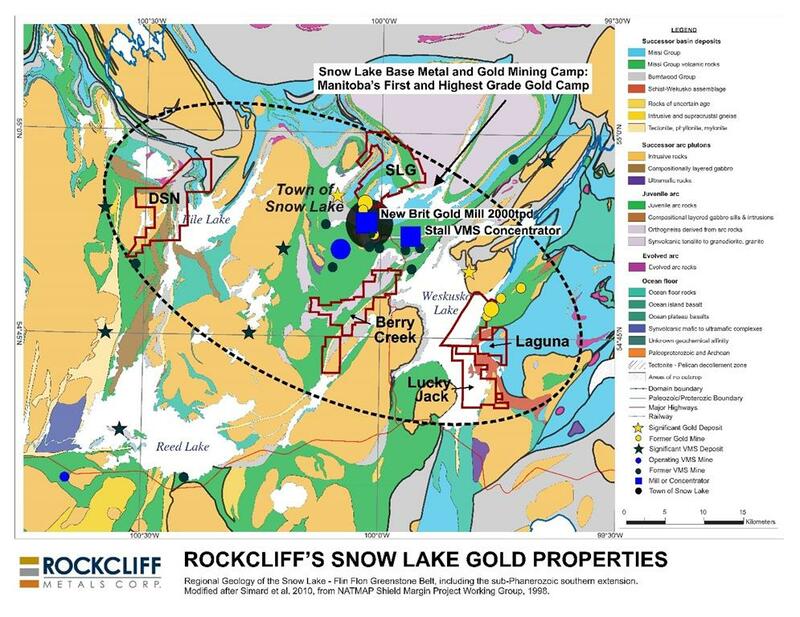 Figure 1 - Rockcliff's 5 district-sized gold properties in the Snow Lake area, including the Laguna Gold Property. The main terms of the DOA, dated July 19, 2018, provide Kinross with the right to earn a 70% interest in both properties by spending a minimum of C$5.5M in exploration expenditures over six years. Kinross is committed in the first and second year to aggregate minimum expenditures totalling $1,250,000. Rockcliff is a well-funded Canadian resource exploration company focused on base metals, gold and royalties in the Snow Lake area of Manitoba. Rockcliff is the largest junior explorer in the Flin Flon-Snow Lake greenstone belt and its extensive portfolio of properties totals over 2,000 square kilometres. It includes 8 of the highest-grade undeveloped base metal deposits and 5 lode-gold properties including the Rex-Laguna gold mine, Manitoba's first and highest-grade historic gold mine. 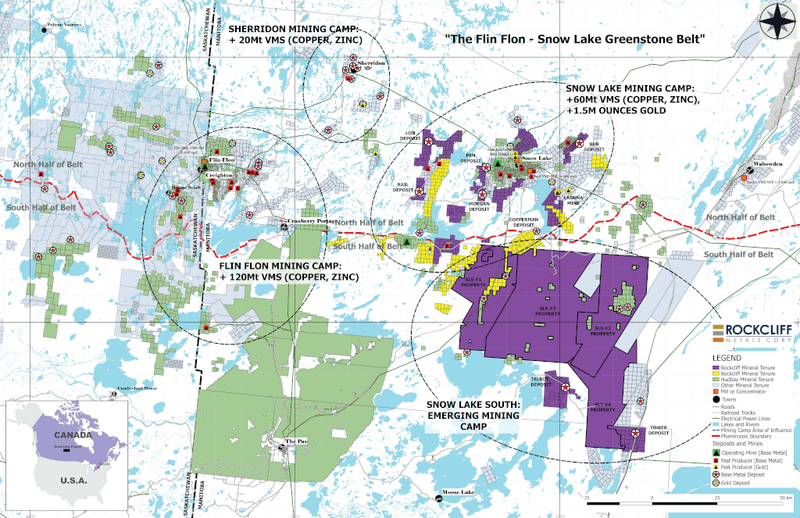 Please access the Company's website at www.rockcliffmetals.com for additional information on Rockcliff's sizeable base metal and gold property portfolio in the Flin Flon-Snow Lake greenstone belt.